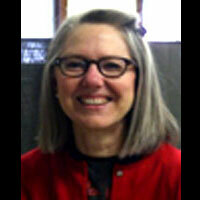 Carla Buchheit earned a Bachelor of Arts degree from Wichita State University. She has studied weaving and fiber art in Finland and has participated in various juried art shows in Kansas, Missouri, and Colorado. Ms. Buchheit is the owner/operator of Ihana Brushing Service, the only napping service for head weavers in North America. She has written articles for Handwoven magazine and taught fiber finishing workshops in weaving conferences across the country. Since 1993, she has been a guest artist at John Diemer Elementary teaching fiber art.